Friday, November 16, employees of Pegasus Optimization Managers, LLC, from Pleasanton, donated 50 dinner boxes, along with H-E-B vouchers for a 12-16 lb turkey or ham, to families. 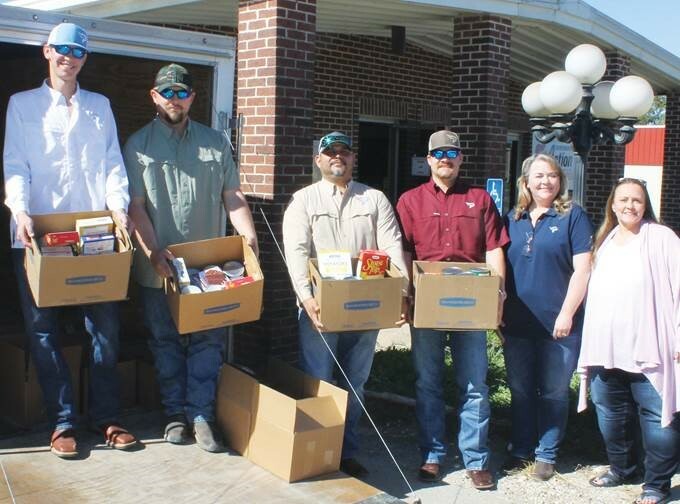 The boxes included boxes of instant mashed potatoes and stuffing, cans of green beans and corn, gravy mix and a cake mix with icing.The boxes were handed out through assistance of Community Council of South Central Texas in Jourdanton.All of the employees of the Pleasanton and Cuero areas donated the funds and food items for these boxes. Pegasus Optimization Managers, LLC was founded in 2015. It is a natural gas contract compression and solutions provider. Pegasus engineers, designs, fabricates, operates, services and repairs its compression equipment and maintains related support inventory and equipment. Pegasus currently operates in multiple conventional and unconventional shale plays across six states. The Pegasus office for operations in the Pleasanton area is at 740 South Main Street while their corporate offices are located in College Station, Texas. Employees of Pegasus Optimization Managers, LLC, helping with the food drive are, from left, Joe Wells III, Tech; Kyle Baker, Tech; Randy Garci, Regional VP; John Armstrong, Supervisor; Dorothy Kilgore, Administration; along with Merlene Salmans, Community Council of South Central Texas, County Coordinator.